Looking for a quiet activity on a hot summer day? Nothing beats the heat like a movie day with a big ole' bowl of popcorn. Why not throw in a little financial education while you are watching the movies with your kids. 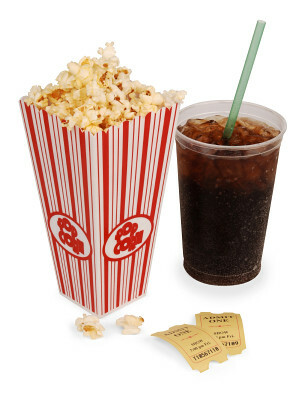 Here are 10 movies for kids & teens that can be great financial conversation starters. Charlie and the Chocolate Factory (Rated PG): In this classic movie, Charlie learns that honesty is the best policy and that greediness and spoiled behavior will cause you problems. Conversation starter: Did gaining control of the factory change Charlie's family? If so, how? Richie Rich (Rated PG): Richie is the richest kid in the world but learns that true friends and a loving family can save the day. Conversation starter: Is it easy to be friends with someone who has more money & gadgets than you? Why or why not? Field of Dreams (Rated PG): A farmer follows his dream of building a baseball field, even when faced with scorn and skepticism from friends and family. He learns that big risks can sometimes have big rewards. Conversation starter: Do you have a dream? What would it take to make it a reality? How much would you risk to make it happen? Toy Story 2 (Rated G): Woody discovers that he is not just any old toy. He is a collectible toy worth a lot of money and is taken away by a greedy collector. Buzz and friends start a Woody rescue mission. Conversation starter: Why did Buzz want to rescue Woody? Did being worth a lot of money make a difference to Woody's friends? Brewster's Millions (Rated PG): A minor league baseball player (Richard Pryor) learns that he will inherit $300 million. There's a catch --- he must spend $30 million in 30 days without telling anyone before he can inherit the full amount. This is a really funny movie with lots of acts of kindness. Conversation starter: What would you do with $30 million? Mouse Hunt (Rated PG): Two brothers inherit an old string factory and an even older house. The house is inhabited by the world's trickiest mouse and the brothers try to get rid of it so that they can sell their assets and walk away with the money. They are faced with three choices: revive the old family business, come up with a new business or walk away with some cash. Conversation starter: What would you have done in their situation? Mary Poppins (Rated G): Although the father in this classic story is a banker, it is Mary Poppins who teaches the true financial lessons. The truly important things in life are family and love, neither of which require great wealth. Conversation starter: If Mary Poppins were your nanny, what kinds of things would you do together? Kidco (Rated PG): Two kids go into business together selling horse manure for fertilizer. They are successful but get into a little tax trouble. Conversation starter: What things should you learn about before you start a business? The Princess and the Frog (Rated G): Two young girls, Tiana and Charlotte, are best friends and hear the story of the frog prince. Charlotte announces that she will kiss every frog she meets in order to marry a prince someday. Tiana thinks that is gross and decides she wants to open her own restaurant when she grows up. The story jumps forward ten years and follows the girls as they each chase their dreams --- one for a rich prince and the other for her own restaurant. Conversation starter: Which girl do you think is happier? Why? The Greening of Whitney Brown (Rated PG): Whitney Brown is a spoiled, rich, middle-school girl. Her family has an extravagant, posh lifestyle that suddenly ends when the family fortune is lost. They move to their Grandpa's farm and Whitney learns a few things about what is truly important in life. Conversation starter: What was Whitney's biggest adjustment when she moved to the farm? Who adjusted easier to the new lifestyle, Whitney or her parents? Why? What other movies are good for starting financial conversations with your child? I was right with you for the first few movies but I have never seen the last 5. I think the correlations with Richie Rich, Toy Story, Field of Dreams, and Charlie and the Chocolate Factory are good ones! I also think the movie Blank Check would be a good one. Teaches kids you shouldn't just take money that's not yours. I haven't heard of Blank Check. Thanks for the recommendation. I'll have to put it on the list for the next movie night! Nice list Pam. I also like "The Rookie". Shows what determination can achieve. Is that the movie with Dennis Quaid as the baseball player? I vaguely remember watching a really good baseball movie few years ago with my boys. Hmmm...time to google it! Thanks, Thad! Our younger two haven't seen this movie yet. I think they will love it. We are quite the baseball family! Richie Rich is my absolute fav childhood movie! Great ideas here! I always loved the movie "Brewster's Millions" and often think about what how it totally turns your perceptions of money upside-down. Turns out that when you HAVE to spend $30 million in a month, it's not all it's cracked up to be and just because you have a ton of money doesn't mean all your problems go away. Thanks for these great movies! I was a fan of the Disney movie Blank Check - I didn't even know what a check was until then! Since I don't have kids I haven't seen most of these movies, but I do think the ones I've seen are good choices.